We Shall Overcome will raise funds for The Welcome Centre. Supporting for those hit by the worst effects of austerity. Pat Fulgoni could sing a pearl from its oyster" says US magazine Billboard. “Deliriously flowing soul” says DJ Mag. "His singing has a confrontational musicality British pop hasn't seen since Jack Bruce" says Wire magazine. From jazz with local maestro Matt Bourne to psychedelic improv with NYC guitarist Gary Lucas (Jeff Buckley / Capt Beefheart), from drum n bass with dance stage headliners Camo & Krooked and Technimatic, to his own live soul blues project and local rock dance act Kava Kava with whom he toured the world, Pat has worked across numerous genres. In addition he has run labels and developed multi stage festivals in the Kirklees area and had his music licensed to US film and TV. 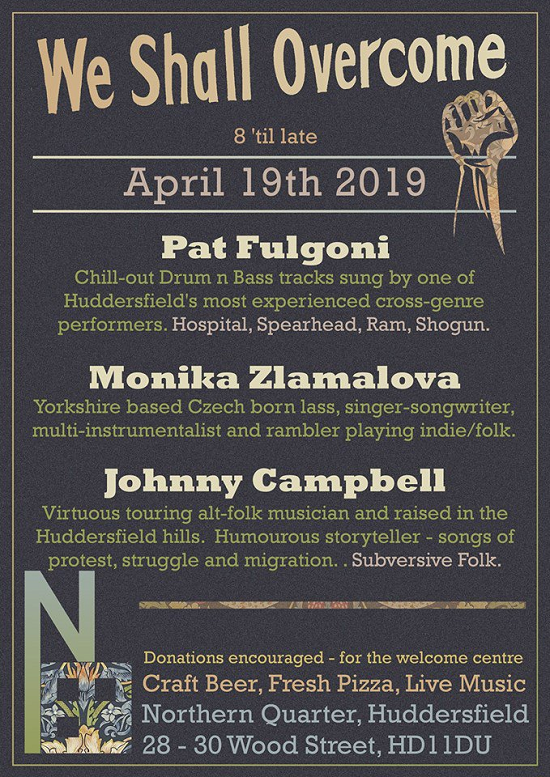 Pat has shown consistent commitment to the local music scene, in the past he developed the Yorkshire stage at the British Music Embassy venue, SXSW (USA). He was awarded the Examiner Community Awards for the Arts for his multistage Timeless Festival events in Huddersfield.